Adjust sliders to calculate pool salt. Optimal salt PPM very by manufacturer, Check your system for the recommended salt level. For proper chlorine production in a salt water pool, it is extremely important that the salt parts per million(PPM) to be kept as close to the system recommendations as possible. Operating a chlorine generator outside the recommended salt PPM can result in poor chlorine production or even damage to the chlorine generator itself in some cases. When adding salt, open the bag on the corner and walk around the pool while pouring the salt in evenly. It can take up to 24 hours after adding salt to dissolve completely and circulate through the entire pool. A salt water pool is a more convenient and healthy way to chlorinate the pool water. The chlorine is produced on site in a closed loop with the salt directly in the pool, eliminating the need to purchase and transport chlorine. The salt water pool generator provides a more automatic granular method of controlling the chlorine dosing. With the salt water pool generator, chlorine is constantly being produced. Making it easier to adjust the chlorine level on a daily basis as opposed to dumping large amounts of chlorine every few days spiking the chlorine levels. The salt water is said to have some health benefits like softer skin and better feeling water. Salt water pool generators also reduce eye and skin irritation. Salt water pool generators convert salt to chlorine. Having low salt levels equals less chlorine because there is simply fewer salt particles entering the cell to be converted to chlorine. Low chlorine production due to low salt cannot be corrected by adjusting chlorine production on the salt system. Running the chlorine generator in a low salt environment adds extra stress to the cell plates during the electrolysis process. This extra stress causes them to wear down faster than normal resulting in early cell replacement. Some systems may shut off if the salt gets too low. Most salt systems function better on the higher side of the system recommendations. They produce more chlorine and puts less stress on the cell extending the life. Most salt systems will encounter problems or quit operating with salt levels above 5000 PPM. Salt water pool maintenance doesn't have to be a pain. Salt should be tested when the other pool chemicals are tested. Because salt is a dissolved solid and doesn't evaporate, the pool salt levels will not change often. Heavy rains, backwashing and adding new water will lower salt counts. Salt is a dissolved solid and should need adding when pool water is diluted. 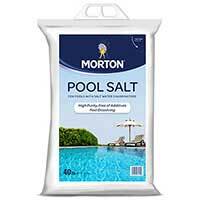 When adding salt open the bag, walk around the side of the pool pouring evenly around the sides. Salt can take up to 24 hours to dissolve for the full ppm increase. Keeping the salt pool ppm on the higher side of the recommended range helps the system produce more chlorine reducing the needed run time. Higher salt also reduces stress on the cell blades making them last longer. A common misconception is salt water pools are chlorine free. This is not the case. Chlorine is produced by the salt system using the same process, liquid chlorine and bleach is produced. LOOKING FOR A CHLORINE FREE POOL? 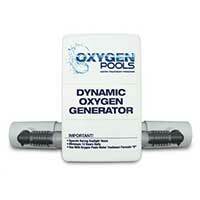 Oxygen Pools water treatment eliminates the need for chlorine. The Oxygen Pools Program uses two components: A Dynamic Oxygen Generator and a weekly dose of the nontoxic, non-chlorine additive. Want A Chlorine Free Pool? Oxygen Pools is the first true chlorine free solution for above ground pools. Say good bye to chlorine. Track and chart chemical test history for multiple pools. Save pool equipment configuration. Save operating notes, warranty details and manufacturer support info for each piece of equipment. Pool Chemical Calculator suite is for educational purposes only. Pool Chemical Calculator is not responsible for any actions taken based on the results of these calculators. Manufacturers recommended dosing amounts should always be followed when available.